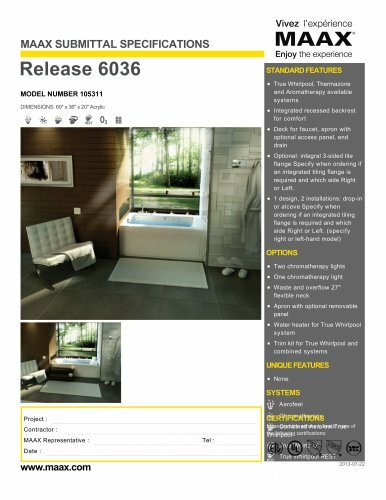 DOOR SELECTION Combine with MAAX's complete shower door offering visit www.maax.com MAAX SUBMITTAL SPECIFICATIONS Release 6036 MODEL NUMBER 105311 WHIRLPOOL SYSTEM ( ) : Indicates whirlpool jets positioning ( ) : Indicates airjets positioning Bathtub base includes anti-vibration Neutra-Phone leg supports (not shown). All dimensions are approximate. Structure measurements must be verified against the unit to ensure proper fit.